Alsmost every slingshot enthusiast,despite the fact that he has a variety of commercially available models to choose from, will start to make his own slingshots sooner or later. Doing so can save you money, give you a model that perfectly suits your shooting style, or, if enough work and good materials are put into to it, results in a beautiful art-like piece of equipment that underlines the dedication of its owner towards slingshooting. The rubber bands are the slingshot's soul. They store and release the energy that is used to propel the ammunition. Bands are replaceable, and many of a slingshot's characteristics change along with them. 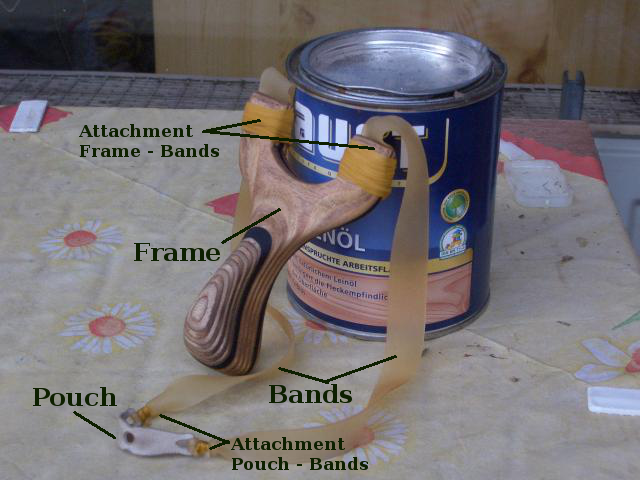 The frame is the part that is held by the shooter, and keeps the rubber bands in place. It is not as important as it seems, but it plays its part in keeping the shooting process comfortable and obtaining a good sight picture. Saftey considerations are important when constructing the frame, as failure of this part can lead to severe injuries. A pouch is needed to hold the projectile in place before and during the shot. Keeping it at the right size and weight is crucial to get a good performance. The bands must be fastened to the rubber strands. Doing this the right way inceases accuracy and band life. This small component plays a crucial role in band lifespan and sight picture. It also dictates what types of rubber bands can be used. A variety of additional parts - such as sights, stabilizers and wristbraces - can be employed to improve a slingshot's performance or accuracy.